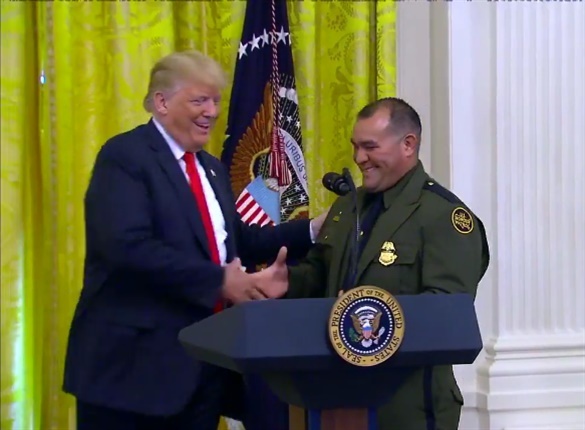 President Donald Trump used a White House event Monday to honor officers of the U.S. Immigration and Customs Enforcement and the Customs and Border Protection. Trump has assailed some Democratic lawmakers for seeking to abolish ICE ahead of the November midterm elections. In a letter to state and local leaders, Trump wrote that ICE workers had been subjected to a “nationwide campaign of smears, insults and attacks” by politicians “catering to the extreme elements in our society,” Q13Fox reports. Trump called Customs and Border Protection Agent Adrian Anzaldua to the podium to tell the story of how he rescued 78 people from a locked trailer near Laredo, TX. Trump praised Anzaldua as a lifesaver.